THE BULLDOGS STAND ALONE... as two legends move on. Two big stories in Rugby League this week with Wayne Bennett announcing he will not coach the Dragons in 2012 and Darren Lockyer set to retire at the end of 2011... as a result the poor old Bulldogs at 3-0 are getting no love whatsoever. Welcome to Season 2011... after an off-season that often feels longer (or shorter - depends if you like cricket or not) than it is - the footy is back. Here on www.wdnicolson.com we've got all the Tuesday Team News, Wednesday Previews and Friday Late Mail that will keep your Tipping and Fantasy habit well fed. This preview integrates our NRL Injured List - which if you haven't bookmarked by now - I suggest you do so. Truthfully there is no perfect formula but here's a vital tip to help you cope with the copious amounts of NRL Tipping Comp's you are already in - PICK ON TUESDAY and enter your tips into all the sites no later than Wednesday. The reason for this is you can A. There is nothing worse than trying to cram your picks in late on a Friday afternoon and B. If you pick on Tuesday you can always change your mind and you would have given the Round some thought before Friday 7:29pm. Round 4 Preview - 2011. This week Darren Lockyer retires and Wayne Bennett wants a new challenge and EYES is back with his picks. Join Matt, Dave and Waz plus special guest Maria Tsialis from Big League Magazine as we preview Round 4 of the 2011 NRL Premiership. Nic is on the Injured List this week and we hope he's back with us next week. Topics include Wayne Bennett's next stop as a head coach, Darren Lockyer's retirement, Round 4 Game Previews and Picks, Maria Tsialis gives us the Round 4 scoop from Big League and of course regulars Matt, Dave and Waz discuss the Round 3 action, lay out their Special Fried Rice Picks and plenty more. Join Our Facebook Page and the Tipping & Fantasy League details which are a footy lover's best friend during the regular season. NOT The Footy Show Episode 54 - March 31, 2011. 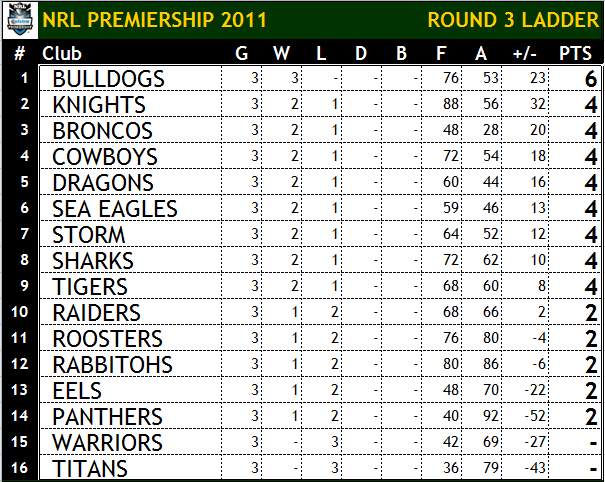 As released on Tuesday March 29, Each NRL Team for Round 4 will be listed below. BRI: Beale, Copley, Reed, Hodges, Yow Yeh, Lockyer (c), Wallace, Thaiday, McCullough, Hannant, Glenn, Gillett, Parker. Bench: Hunt, Te'o, McGuire, Tronc. PEN: Coote, M Gordon, Jennings, Tighe, Simmons, Burns, Kingston, Grant, Iosefa, Civoniceva (c), Waterhouse, Plum, Lewis. Bench: McKendry, Bell, Purtell, Tahu, Seluini. SOU: Wesser, Merritt, Inglis, Farrell, Talanoa, Sutton, Sandow, Asotasi (c), Luke, Stuart, S Burgess, Taylor, Tyrrell. Bench: Ross, McPherson, Crocker, McQueen. MAN: B Stewart, Robertson, Lyon (c), Hopoate, D Williams, K Foran, Cherry-Evans, King (c), Ballin, Kite, Watmough, Galuvao, G Stewart. Bench: Seu Seu, Buhrer, Rose, Mauro, Robinson. Check it out for a great Podcast, SuperCoach advice and weekly blogs for every AFL Team during 2011. You've heard the saying; a draw is like kissing your sister. But for the Sydney Swans their draw with the Melbourne Demons must've felt more like kissing your mother in law... something you really don't enjoy but realise that civility is better than the alternative. The Swans will be feeling like that today in the wake of their 84-all draw, because as frustrated as they may be with only 2 points - the alternative of 0 points would have been much worse. ROUND 3 SO FAR... Brisbane win with their defence, Titans can't score to save themselves, South Sydney wake up, Parramatta still don't have any halves, Cronulla keep the good times rolling, Penrith pretend to care, Wests Tigers win but at a cost, the Raiders get Benji'd, Dragons re-assert themselves, Warriors look rudderless, Bulldogs laughing at 3-0, Roosters can't capitalise late, Manly coast, Knights battle with injuries, North Queensland dominate and Storm get dominated. All NRL Tweet Player of the Year Votes are added as awarded. Here on www.wdnicolson.com we've got all the Game Results, Match Reports, Game Highlights, Game Stats, Injury News & NRL Tweet Player of the Year Award Votes in the one place. This year not only do you get The NRL Tweet's Tips each week but the whole NOT The Footy Show team will have their picks listed by Thursday so you can back a smoky or a favourite by seeing who we all picked (or didn't pick). We make no promises that we'll get everything right but at least one of us should be good for a lazy 60-65% success rate in 2011. Check out the Round 3 Review below. NOT The Footy Show's Round 3 Podcast.